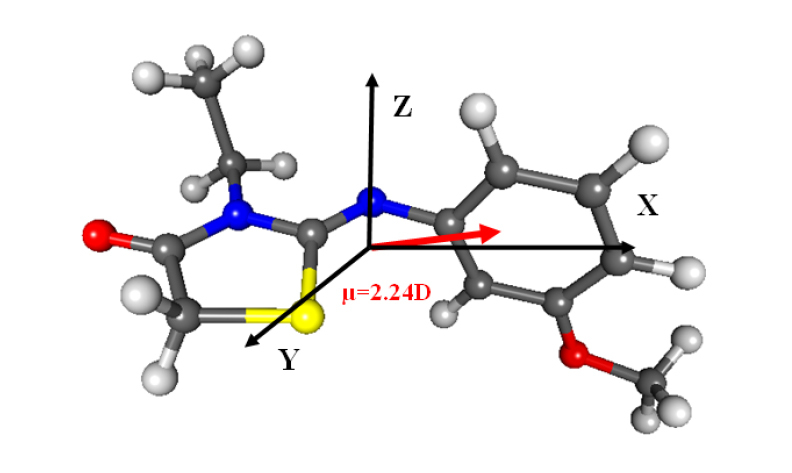 In this paper we report the synthesis and characterization of the (Z)-3-N-(ethyl)-2-N'-((3-methoxyphenyl)imino)thiazolidine-4-one by means of FT-IR, 1H and 13C NMR and by single crystal X-ray diffraction. The experimental determination of the crystal structure of the compound has been achieved using X-ray diffraction data. The important characteristic of the structure is the existence of a dihedral angle formed by the benzene and thiazolidinone rings being equal to 86.0° indicating an absence of π–π stacking as well as that the structure is non planar. In the crystal, the molecules are linked by C–H···O and C–H···N hydrogen bonds, these bonds being responsible for the three-dimensional molecular structure packing. In order to compare the experimental results with those of the theoretical calculation, quantum chemical DFT calculations were carried out using B3LYP/6-311G(d,p) basis set. In this context, the molecular electrostatic potential around the molecule and HOMO–LUMO energy levels were also computed. The dipole moment orientations were determined in order to understand the nature of inter- and intramolecular charge transfer. Finally, the stability of the title compound was confirmed throughout the calculation of the chemical reactivity descriptors. X-ray diffraction; single crystal; DFT calculations; spectroscopic (FT-IR,1H and 13C NMR).